Setting up a backyard feeding station for birds is a good way to attract them to your property as visitors and, perhaps, spring and summer residents. Not only does feeding birds reward you and your family with hours of delight and the birds with life-sustaining nutrition, but it benefits the health of your plants as well. Birds are significant allies in the battle to control pest insects on your landscape plants. Even seed eating birds seek out insects, their eggs and larvae to supplement their diets and feed their babies. Because their preferences in insects and how they hunt them vary, the more different kinds of birds you welcome to your yard, the more effective and comprehensive pest control they provide. One of the handiest tools for folks having to keep bird feeders filled is a good quality scoop. 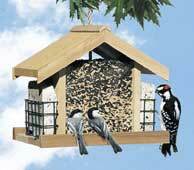 CLEANING ANY FEEDER IS CRITICAL TO AVOIDING DISEASE FOR SONG BIRDS.